What about Darwin, for starters | What About Victoria? As Mini-project one and Mini-project two attest, our first order of business was basic orientation–through exposure to snatches of Victorian culture and through acquaintance with a framework of facts with which we need to be familiar in order to proceed. This basic orientation has taken place in the classroom, and, perhaps more interestingly, outside it. Charles Darwin’s significant contributions to biology have changed quite remarkably our understanding of life on Earth, of course. Perhaps a little less obvious is that Darwin–yes, you guessed it–is straight out of Victorian England (à la NWA ‘straight outta Compton’, or, if you prefer, Eminem ‘straight out the trailer’). 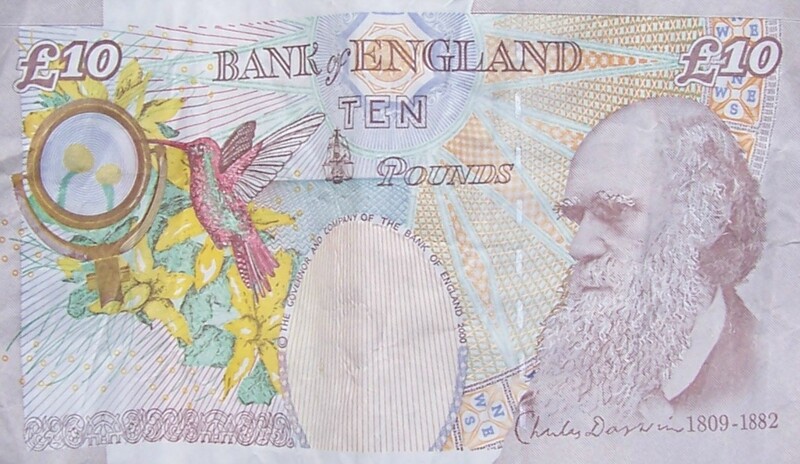 With no planning involved at all–except that I should have English currency in my pocket–Charles Darwin, straight out of my backside pocket on the backside of a ten-pound note, embodied influences of Victorian England in modern London, even in my wallet. He made for an interesting dinner conversation topic. Oddly enough, our conversation found its way eventually to the Creation Museum, reportedly home of perhaps the world’s most motivated museum staff.